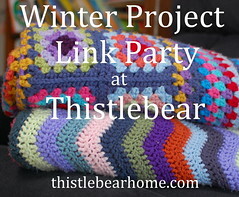 I'm joining with Jennifer's winter project link party. I was too late to join last year and have been looking forward to it all summer. At home in the UK, we are just about to have a double fronted multi-fuel stove fitted to heat both the lounge and dining room simultaneously. There's a stove in the lounge already (that will be replaced) and the wall behind this will be knocked through. I'm not looking forward to the mess but I am looking forward to crocheting in the fireside chairs in the dining room. I've crocheted this blanket for a single sized bed, I found it whilst browsing Lucy's blog at attic 24. She was inspired by her walks in the Yorkshire Moors and designed the Moorland blanket. Using her photographs she put together these colours in a yarn pack that's sold at Wool Warehouse. It seems like I've been making the Moorland blanket for ever, it was originally started in January as part of a CAL (crochet a long). The aim was to receive an update from Lucy each Friday with the next instructions and a finish on week 8. So why has it taken so long? There are many reasons which all seem insignificant now that I try and think of them. Crocheting under the warmth of a blanket in the summer months was one reason. I also found that taking the blanket to local Knit & Natter groups was not without it's own time consuming ventures. People would want to look at it, touch it, pass it round the group. They'd question me about the yarn, the colours, it's eventual use, wanting to see the pictures on-line that inspired the designer. They'd want an explanation of how the Neat Wave pattern is formed, the stitch sequence and generally marvel at it's beauty before allowing me to continue hooking away before it was time to pack up and go home. In the beginning I arranged the colours on labelled pegs which also gained comments at the Knit & Natter group such as 'you'll run out of wool'. I found wrapping the yarn end round the label was perfectly adequate at keeping check on the yarn colours. I think the light must be bad today as the violet and wisteria shade look blue in this photo. It is nice to see all the yarn together and remember the start of this blanket. When I fold up the blanket after working on it, I tend to forget all about the starting colours. The blanket began with the deep greens and muddy browns before moving through the rich heather tones. Next up was the lighter heather and greens drifting up to the sky. It looks so different now as it's so much lighter in both shade and fresh cool colours. At the moment, I'm using just these 3 colours - Cloud Blue, Storm Blue and Duck Egg for the last 10 rows. I'm seriously regretting not sewing in all those pesky ends as I progressed. To finish it will need a round of 4 rows to complete a neat edging. My aim is to finish this blanket before starting anymore projects. Though I may still take something small to Crochet Club, it's just easier that way. It's looking lovely. I can imagine all the upheaval you'll have with the work you're having done but I'm sure it will all be worth it when you're cosily crocheting in those fireside chairs. I started a CAL a very long time ago and it's still sitting there unfinished, I really must get back to it again soon. As for sewing in the ends as you go along, I stopped doing that after I went wrong and found out how hard it is to take back crochet when the ends are no more. It'll be a big job at the end but at least I know I can take it back if I need to. Thanks Jo, I've enjoyed crocheting this blanket very much. I think because it's a CAL and you're aware many others have finished, you always feel like you're playing catch up. Thanks for the tip about the ends, some people were convinced they were deliberate - tassels. Thank you Christina, you're right of course, it's not a race and it has been an enjoyable process really. It's interesting what you said about the yarn, when I was looking back at Lucy's archives, it was quite a while before she took to using Stylecraft. I suppose the cost drove her to source cheaper yarn for customers. Such beautiful colours and I can see moorland in the colours. Enjoy the process it doesn't matter how long it takes. It will be wonderful sitting in front of a blazing stove with the crochet on your lap. Hi Cathy, you're doing great with this blanket! Don't worry about the time frames. I've never done a CAL myself because I've always been worried that I wouldn't be able to keep up, but I really should try it someday working at my own pace. I've always thought it seemed like fun, if I could get over the worries. :) Thank you so much for joining in with my link party, I'm really glad to have you. Originally I'd joined the facebook group as a support but then found peeps worried about if it looked right, or whether they were too slow etc. In the end, I found I wasted less time on my own and began to enjoy the process. I like the idea of doing some crocheting inspired by the colours in nature and this project which reflects moorland and sky would be just up my street. I haven't done much crocheting in recent months, but recently got going again. When I've finished I would like to crochet something that uses many colours rather than just three or four. All the best with installing the stove which will be worth doing later on when you can sit by that cozy fire. I think all of Lucy's kits for her blankets use many colours, this particular one uses 15. Her Coastal Blanket was another one inspired by an area, this time at the Dorset coast. These colours are beautiful! It looks lovely. Thank you Let's Get Sewing for your comments. Just been looking at your blog, it's lovely. When I was in secondary school,I did sewing and loved it. I hardly sew at all now preferring knitting or mainly crochet. I've lost count of the patterns and material I've bought but never used. At school I made a skirt, dress and a top. For the last yrs I choose soft furnishings and made curtains and a bed spread - basically a giant pillow case for my open sleeping bag to go in over my bed. Like a modern day quilt. We had to produce a very interesting folder, mine was very thick, stuffed with info and magazine clippings on every subject related to sewing. Memories. It's beautiful! I started a ripple blanket from Attic 24 Wool Warehouse a few months ago and I'm not very far along either. I'll get it done though. I'm enjoying the journey! Finish for the Weekend - Crocheting Poppies.